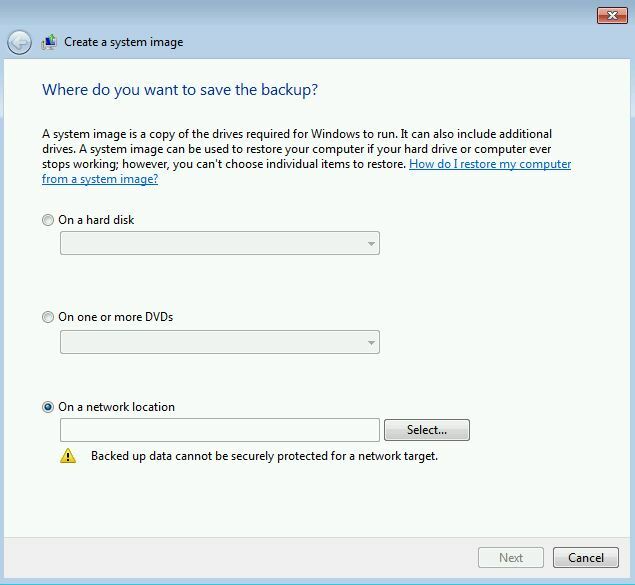 In my last Windows 7 article discussing how to create and restore backups, I looked at how to back up user data. 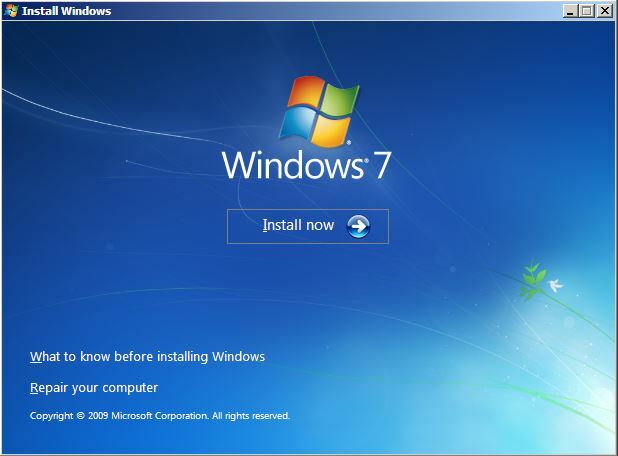 In this article, I am going to discuss the other part of creating and restoring backups in Windows 7. 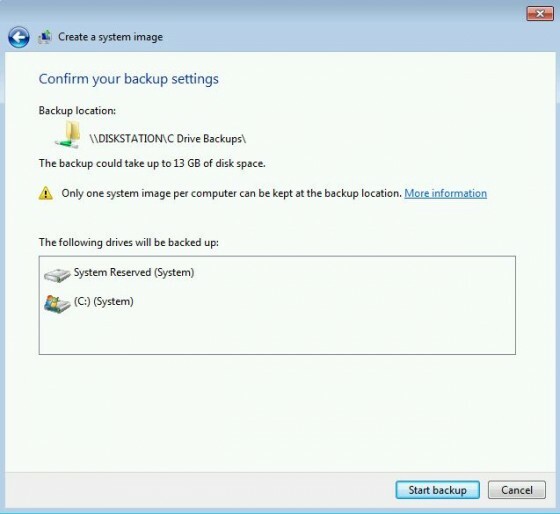 The other type of backups is the creation and restoration of system images. System images are used as one way to recover from issues that have prevented the computer from booting normally. A system image contains the Windows installation, programs, files, and folders on a selected drive. Everything on that drive is included in the system image. Unlike Windows Backups, users cannot select what they wish to include with this backup method. 3. 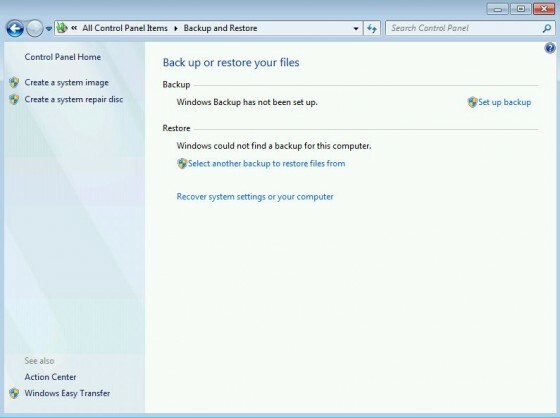 If viewing by Small icons or Large icons, select the Backup and Restore option. If viewing by category, click on Back up your computer. 4. Click on Create a system image. 5. 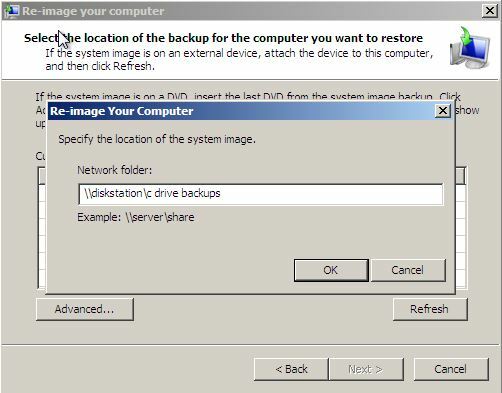 Select the backup save location. I am going to have to use a network location for the save location for the system image as my virtual machine does not detect other the other hard disks on my computer and I do not have an optical drive configured with the VM. If using a hard disk or optical drive, select the location and continue on to step 8. If using a network location select the option titled On a network location. 6. Click on the Select… button. 7. A new window will load asking users to select the network location. After clicking the Save on a network… button, the next screen to load is the Select a network location screen. 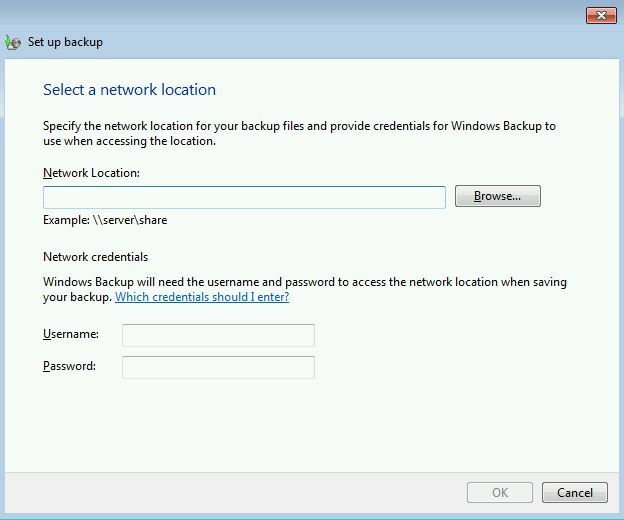 On this screen, users will need to enter the network location and login credentials for the network drive that the system image backups will be stored on. If necessary, click on the Browse… button and then browse to the network location needed. 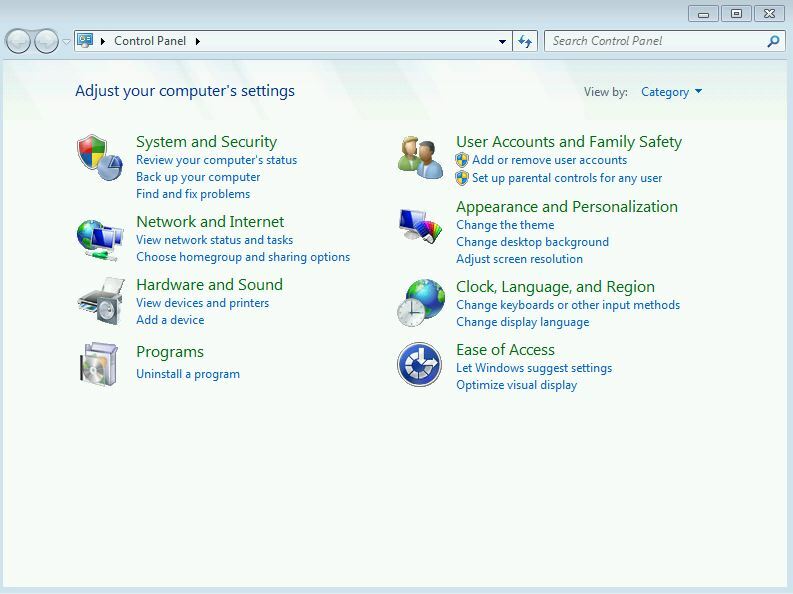 After selecting the network location, users will be need to enter the login credentials needed to access that network drive on the Save a network location screen. 8. Click OK. 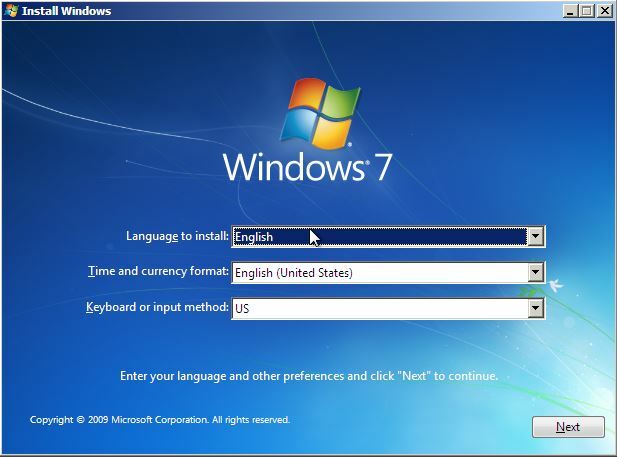 This window will close and users will be back to the main Create a system image window. 10. Confirm the backup settings. 11. Click on the Start backup button. 12. At this point, Windows will create the system image backup. 13. 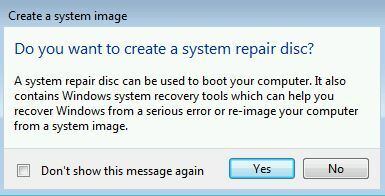 After the system image is created, Windows will load a window asking if the user wishes to create a system repair disc. Users will need an optical disk drive for creating the system repair disc. As my VM does not have an optical disk drive, I am going to select No. If an optical disk drive is available, place the appropriate media type in the drive and click on Yes. 14. 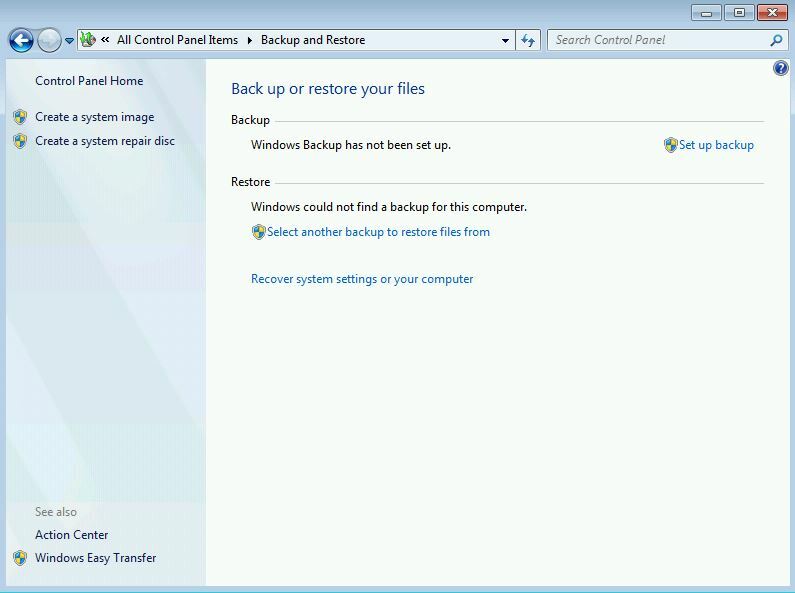 Click on the Close button to return to the Backup and Restore window. 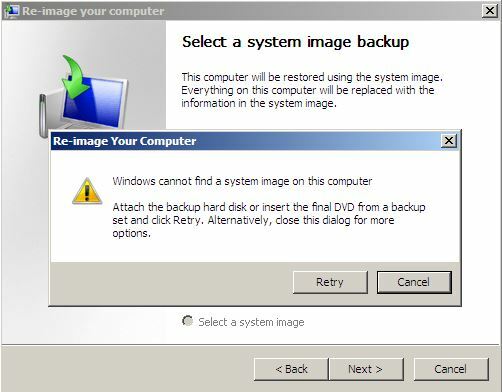 Once the system image has been created, users can restore the computer’s hard drive using the image. 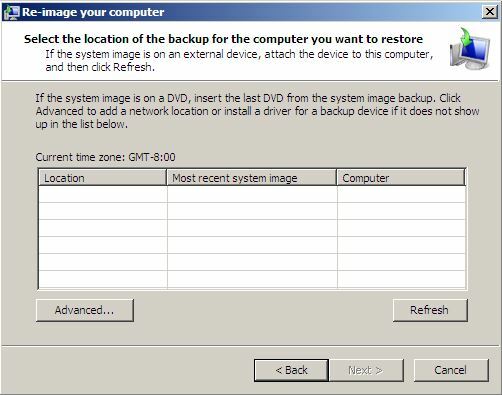 Please use the following steps to restore a computer hard drive from a system image. Restoring a system image can be done in two ways, from within Windows and from the repair tools for the Windows 7 installation media. 4. 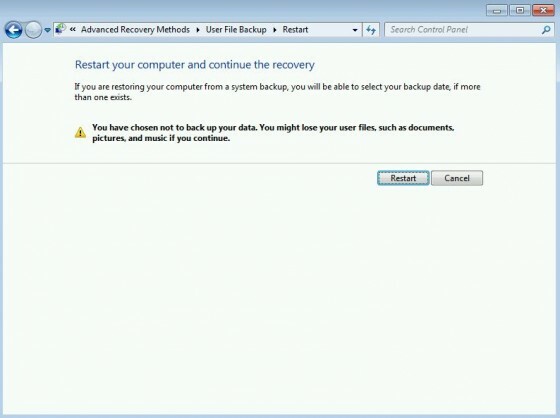 Click on the link at the bottom of the Backup and Restore window titled Recover system settings or your computer. 5. 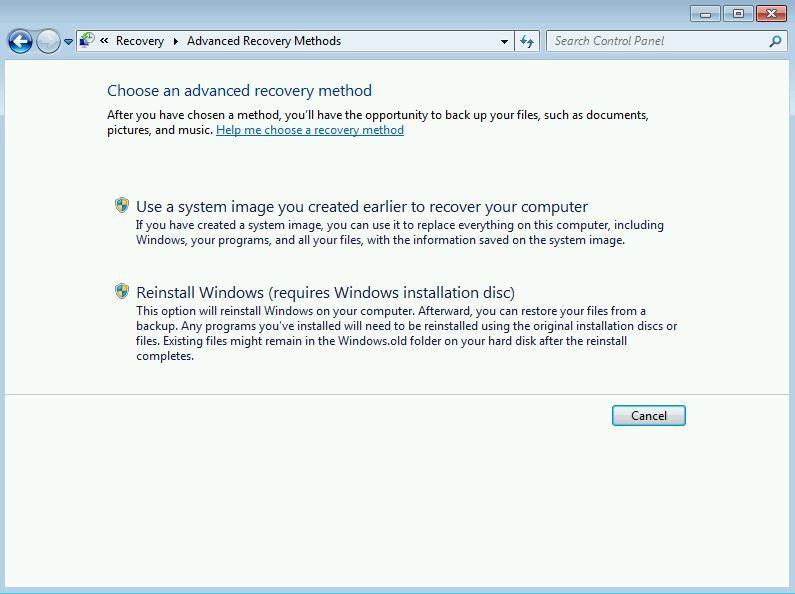 In the right frame in the Recovery window, click on Advanced recovery methods. 6. Click on the link to Use a system image you created earlier to recover your computer. 7. 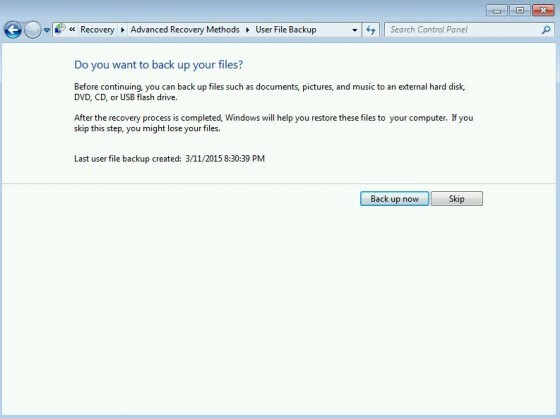 Before performing the system image recovery, Windows asks if users want to back up their files. If users choose to backup their data, it will use the same backup location we identified in the Creating a System Image steps above. 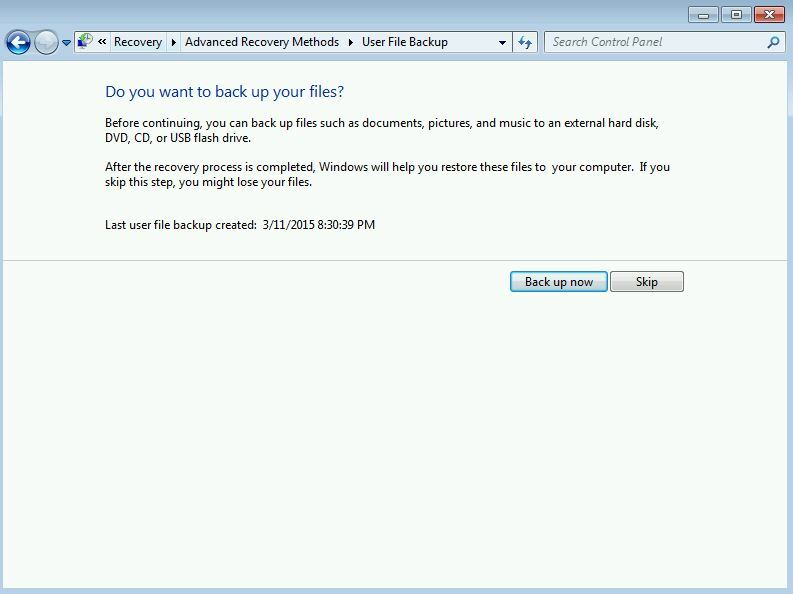 I am going to skip the backup as I already created it using the steps above. 8. On the next screen, click on the Restart button to restart the computer. 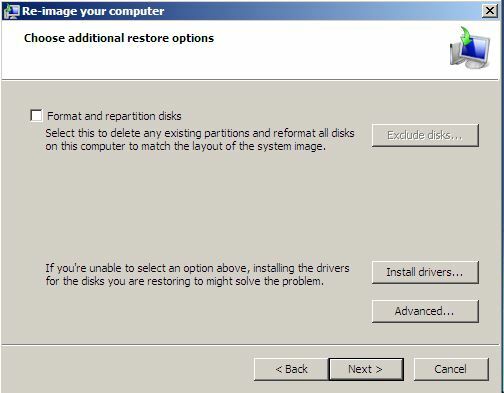 For the remainder of the steps for restoring the system image, please start from the appropriate step in the next section as the computer will reboot into the Windows Recovery Environment. 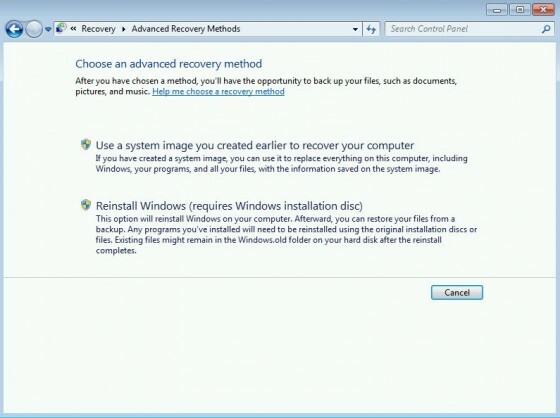 The steps in the next section use the Windows Recovery Environment starting in step 3. 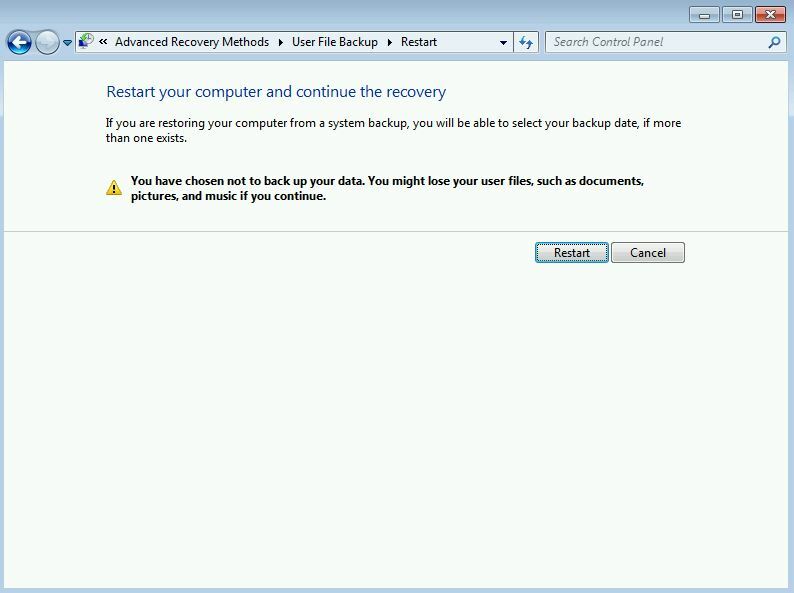 I was not able to finish creating the steps for this process using my VM as I could not reboot into the Windows Recovery Environment because I was using a virtual machine. Before loading the installation media, users will need to make sure the optical drive is the first device in the boot order in their computer’s BIOS. The steps to change the boot order vary between the different motherboard manufacturers so I recommend looking up the specific process for your computer manufacturer if using a prebuilt system or for the process for the motherboard if the computer was custom built. 2. Click on Next in the Install Windows screen. 3. In the bottom left corner of the window, click on Repair your computer. 4. 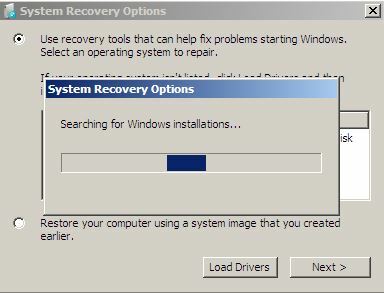 On the next screen to load, System Recovery will search for Windows installations. 5. Users may be prompted with a message that problems were found with the start up options. 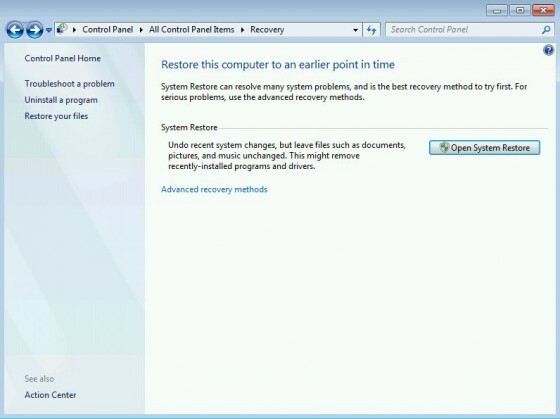 If this message comes up, users can try Repairing and restarting the computer but if the issue is not resolved, start from step 1 again to recover using a system image. If the message comes up again, select No. 6. The System Recovery Options window will load. 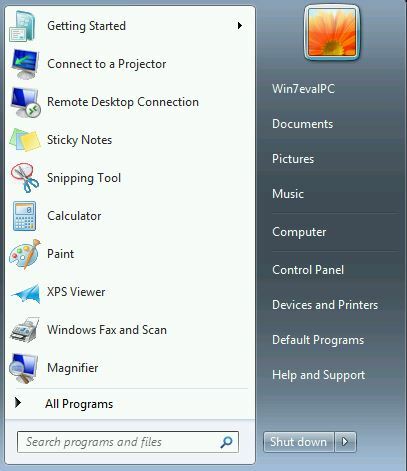 Click on the second radio button to Restore your computer using a system image that you created earlier. 8. 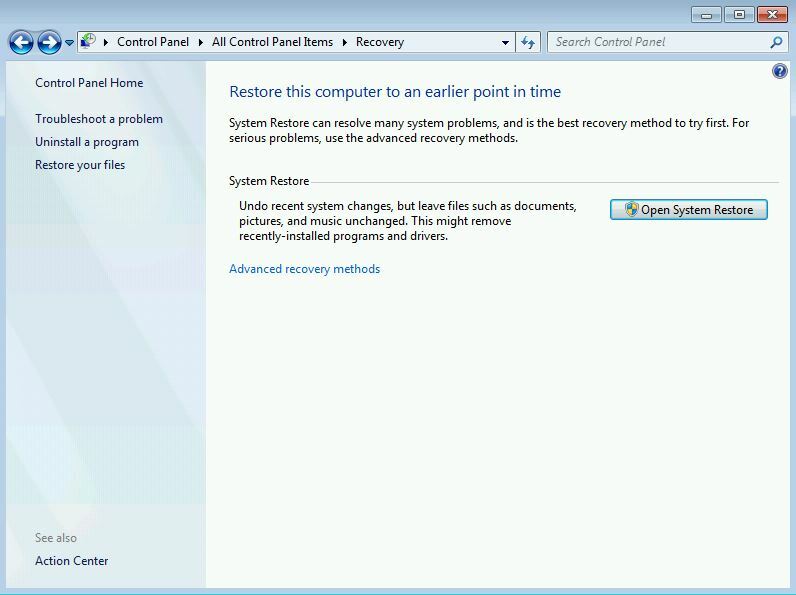 If the Windows Recovery Environment does not find any system images to restore, the Recovery Environment will display the window shown in the image below. If the system image is stored on a network drive, the Recovery Environment will not find the system image and we will need to browse to the network location so that we can locate the system image. 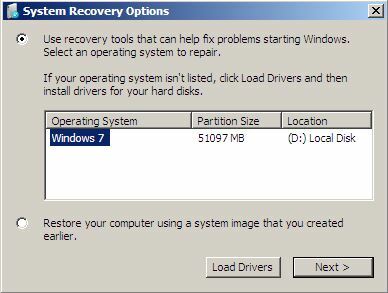 If the Windows Recovery Environment finds any system images, continue to step 9. Otherwise, skip to step 10. If a system image cannot be found, the window below will load. Click on the Cancel button. 9. If there is a system image available, users can select the image or they can use the last system image created. I am going to use the Select a system image option so that I can choose where the system image is located. After selecting the desired option, click Next. 10. On this step, users will need to select the location for the system image if any were found. 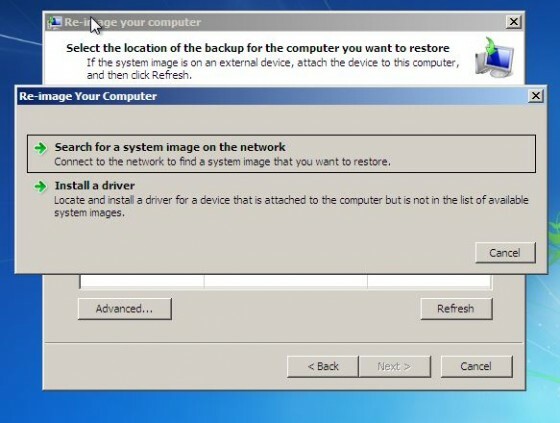 If no images were found or the system image is located on a network drive, click on Advanced. If a system image is available, select the desired system image and then skip to step 15. 11. After clicking on Advanced, users will have 2 options on the next screen. The first option allows users to select a system image stored on a network drive. The other option is used to install drivers if there is one needed before an existing drive will be recognized. If a drive needs installed, select that option and then follow the prompts to browse to the location of the driver. To search for a system image on the network, click on the first option. A confirmation window will appear asking if you are sure that you want to connect to the network. Click on the Yes button. 12. On the next window that loads, type in the path to the location of the system image using the example from the image below. 13. Enter the username and password needed to access the network location if prompted and then click the OK button. 14. 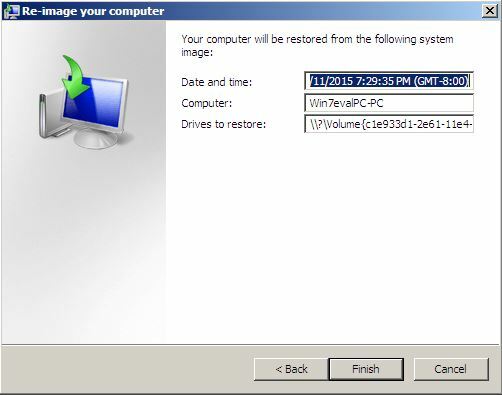 At this point, the Windows Recovery Environment will return to the window listing any system images that were found and now it should show the system image that is stored on the network drive. Click on the name of the system image. 16. The next screen has users select the date and time of the system image to restore. Users may have more than one system image to pick from. Click on the needed system image and then click Next. 17. On the next screen, users can choose additional restore options such as formatting and partitioning the hard drive. If formatting and partitioning are needed, click on the checkbox for that option. Click Next after making any selections needed. 18. On the next screen, users will need to confirm the system image to be restored. After doing so, click on the Finish button. 19. Users will be prompted with a confirmation to verify that they wish to continue with the system image restoration. Click on Yes to continue. 20. At this point, the Windows Recovery Environment will start to restore the selected system image. 21. 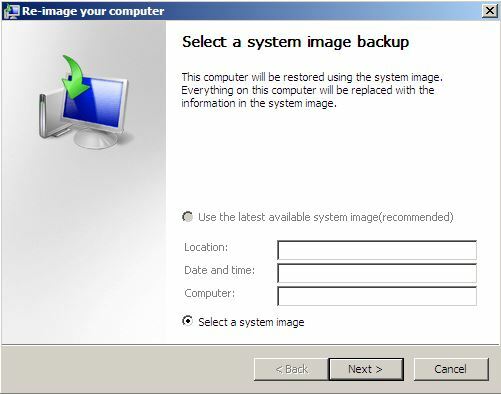 After the system image is restored, the computer will need to restart. Users can either click the Restart now option or they can let the timer run down and then the PC will automatically restart. At this point, users should be able to log in to the computer. 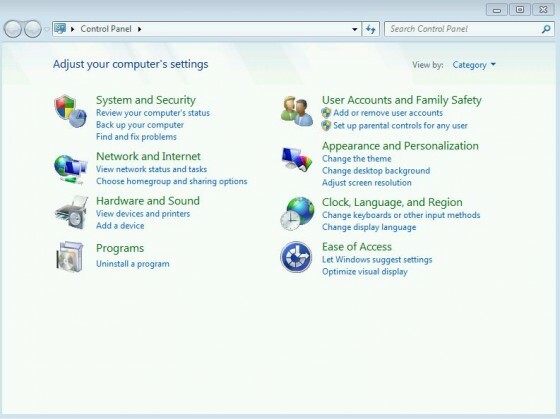 The computer configuration will be the same as it was when the system image was created. Any changes made to the configuration after the system image was saved will need to be made again if needed. 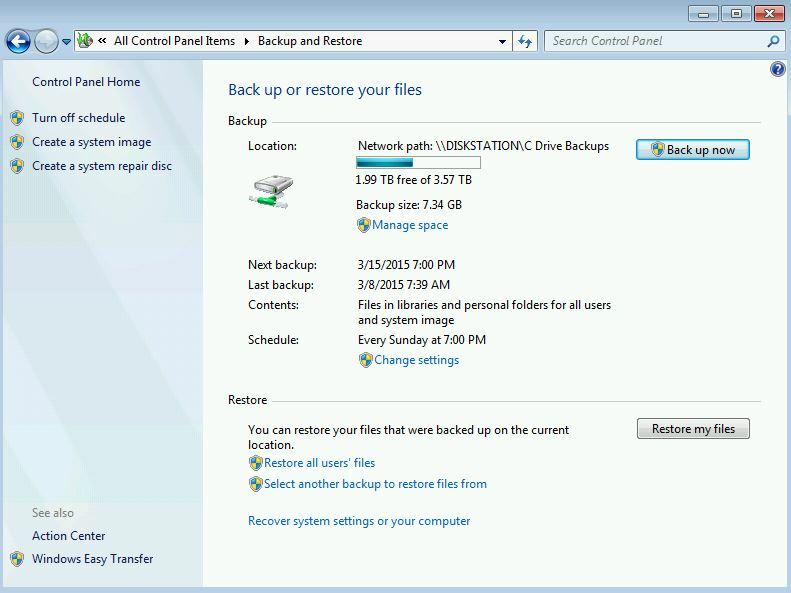 In today’s article, I looked at the second part of creating and restoring backups in Windows 7. System images are primarily used when the system is not functional because of software issues. 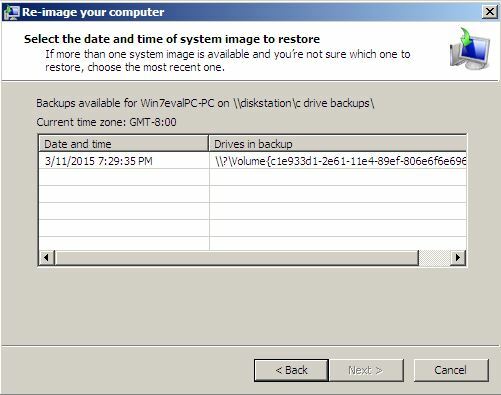 Using a system image can be a good way to resolve issues that are preventing a computer from booting up normally but users need to keep in mind that this backup type does not allow users to select what is restored. Anything that was changed after the system image was created will need redone. As always, please let me know if there are any questions, comments, or concerns by either posting below or emailing me at the link in my bio.